SCM .200" spring clamp terminal blocks are rated at 20A/300V—the highest in the industry—and are supplied in horizontal, angled and vertical configurations. 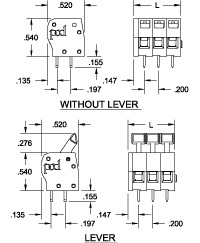 Individual spring contact clamps are depressed to insert or remove wires by either actuating a finger lever or inserting a flat-bladed screwdriver in an actuation slot on the block. The SCM is the only spring clamp terminal block available that is suitable for SMT reflow solder PCB manufacturing processes as well as wave solder; providing users with additional flexibility and maximizing production efficiencies by eliminating secondary solder operations. Blocks are molded of ultra-high-temperature, glass-filled polyamide that will withstand temperatures of 260°C during PCB production. SCM 5.0mm spring clamp terminal blocks are rated at 20A/300V—the highest in the industry—and are supplied in horizontal, angled and vertical configurations. 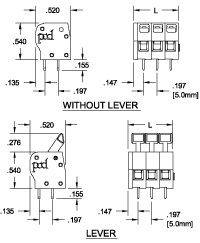 The SCM is the only spring clamp terminal block available which is suitable for SMT reflow solder PCB manufacturing processes as well as wave solder; providing users with additional flexibility and maximizing production efficiencies by eliminating secondary solder operations. Blocks are molded of ultra-high-temperature, glass-filled polyamide that will withstand temperatures of 260°C during PCB production. 150" spacing SCVF spring-clamp plugs utilize a stainless steel clamping spring to provide “screwless” wire termination. 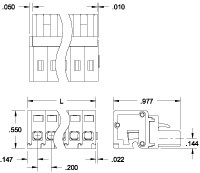 Convenient “front-front” design permits both wire entry and spring actuation from the same connector surface, simplifying operation. When used with stranded wire, an actuating button is depressed to open the clamp and facilitate wire insertion. Releasing the button captures the wire in a gas-tight, high-pressure contact. If 18 AWG solid wire or larger is used, it is not necessary to operate the actuating button. The wire can be inserted directly into the connector, and will be securely retained by the angled clamp. Plugs are available in black or green with tin-lead plating, standard. For gold plating, indicate “1” as eighth digit of catalog no. for black parts; “2” replaces “G” for green parts. Contact Amphenol Pcd to discuss marking and mounting ear options. .200" spacing SCFF spring-clamp plugs utilize a stainless steel clamping spring to provide “screwless” wire termination. 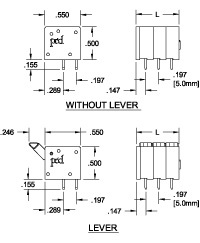 Convenient “front-front” design permits both wire entry and spring actuation from the same connector surface, simplifying operation. 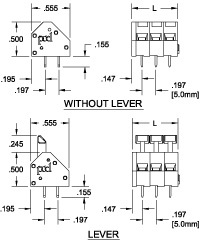 SCFF plugs mate with the complete range of ELF headers shown on pages 41--42 and 44--45, as well as compatible competitive headers. Individual spring contact clamps are depressed to insert or remove wires by a flat-bladed screwdriver in an actuation slot on the block. Once wire is inserted and the spring released, the stainless steel spring clamp maintains a consistent high pressure, gas tight contact between the soft tin-lead plated block contact and the wire.